How To Remove Post Links From Google Search Results? Home > SEO > How To Remove Post Links From Google Search Results? Do you have out dated contents in your blog or any posts that does not meet up your readers demand or any types of low quality contents? Then it’s time to remove such blog posts from your blog. I have already wrote a post about how to find and fix low quality contents from a blog. As I said in my previous post, there are two ways available to take action regarding your low quality contents. Remove the outdated and low quality contents or adding noindex tag. Re-Edit old blog posts with latest updates. OPTIONALLY READ: Why I Choose ShineMat For My Custom Domain Name? So, if you are able to re-edit your old blog posts then just update it as new way. It is a simple way to engage with your readers by your updated posts. LEARN: How To Tell Google To Re-Index Old Updated Contents? If you have some posts those are not performing well or not receiving organic traffic or the service are no longer available or there are no way to update it at all to newer version then you must delete those posts from your blog. I know, deleting a post from a blog is quite simple. 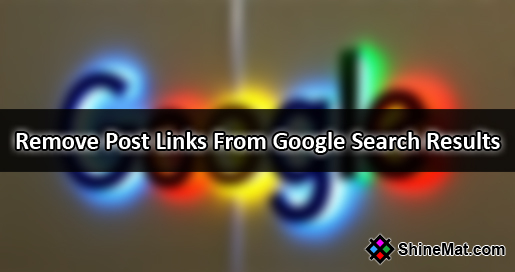 But, how to remove your deleted blog post links from Google search engine database? If you don’t place a URL removal request the readers those will come from search engines will see 404 error in your site. No doubt this message will increase your bounce rate as well as it will destroy your readers’ experience also. So, it is important to place an URL removal request to Google to tell that you have deleted the posts so that they will also remove those posts links from their search engine results. READ: How To Improve Bounce Rate Of A Blog? In this post I will teach you how you can remove noindex or deleted blog post URL from Google search engine listing. Before we go to steps, it is necessary to have a Google Search Console account associated with your blog. LEARN: How To Submit A Blog To Google Search Console? Steps To Remove URLs From Google Search Results? First copy your all post links in a notepad that you want to delete. After successfully noted your links, simply delete your out dated posts from blog. Now, log in to your Google Search Console account and go to Google Removal Tool page and enter your deleted post links from the notepad and click Request Removal button. Google will instantly analyze the link and ask you about confirmation. Click Request Removal. You will see your URL removal request is PENDING. Normally it will switch to REMOVED status within 24 hours. You can track your status anytime just by login to Google Removal Tool. That’s all to do for removing deleted blog post links from Google search engine results. Hope this post helps. If you have any questing regarding SEO, please feel free to ask me anytime through comment below. Now, share this post with your friends. Stay well and Allah Hafez.